Most people have never heard of the 1960 Goliath 1100 Tiger GT Coupe. Nevertheless, if you ever get to own one, the experience is extraordinary. This coupe is exceedingly rare, particularly when in superb mechanical and cosmetic condition. 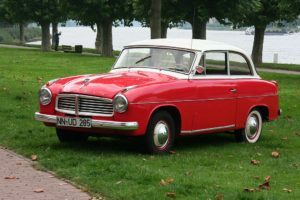 Built in 1961 by the Borgward Company, it was initially marketed as the Hansa featuring in-house parts, front leaf spring suspension, a water pump, an integrated electrical generator, and a mounted steering pinion and rack. Although only a few Tiger Coupés were produced, subtle differences distinguish individual cars. The 1960 model is distinctive due to its scalloped tubular bumpers, finned tail lights and the esthetics of its cosmetic blend. With the Borgward company folding in 1961, production of the Hansa 1100 stopped. Other models such as the Sunbeam Tiger (1964-1967) and Sunbeam Alpine (1957-1961) came out two years after the Goliath. The Goliath’s four cylinder 1100cc water-cooled boxer engine produces 61hp with a top speed of 85 miles per hour. According to its 1960 Road and Track road test, the 1960 Goliath 1100 Tiger GT Coupe one horsepower per cubic inch is standard for this model and period. Additionally, the Goliath features a fully synchronized four-speed transmission, a sliding gear shift, and a 6-volt power system and period bias wide wall tires. A unique feature of the Goliath is its 60-year-old revolutionary front wheel drive train standard in cars today, such as the Subaru. Its furnishing is impressive as well. Interior decor, trim patterns, and materials blend with exquisite detail. Another feature peculiar to the GT Coupe is the white rubber seal on the rear window and front windshield. With a Tiger horn ring, a two-spoke steering wheel, and beautiful interior decoration; the Hansa 1100 coupe is the most coveted model of the Goliath line. A drive in the Goliath is a unique and fun experience ensuring the car’s recognition in motor shows while surprising enthusiasts with its peculiar mechanics. The 61 hp engine is throaty at low revs but smooths out at higher gear ratios providing sufficient torque making the drive enjoyable and satisfying. Part of the reason Classic Cars Online US exists is to help connect classic car buyers and sellers, and we’ve added several ways for you to connect – pick your favorite, or join us in all four places: (1) sign up for the newsletter or visit the Classifieds page here on the site, (2) visit and like this site’s Facebook page, (3) the Best Classic Cars for Sale Online page or (4) join the Classic Cars Online: Classic Cars for Sale group if you are looking to buy or sell classic cars such as the Goliath 1100 Tiger GT Coupe.